Posted on July 5, 2017 at 9:53 am. 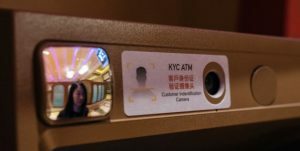 Just days after Macau introduced new facial recognition software to its ATMS, many of the cities popular cash points have been deserted, suggesting users are avoiding the machines fitted with the new technology. So far, the Know-Your-Customer (KYC) technology has been introduced to 834 of Macau’s 1,300 ATMs. Along with entering their usual pin numbers, holders of any China UnionPay bank card are now required to scan their identity cards and stare into a built-in camera for six seconds while the machine confirms their identity. The identification verification only applies to Chinese nationals, and will not impact card holders with accounts issued in Macau or other regions. The Monetary Authority of Macao (AMCM) issued a statement on Monday saying that all Macau ATMs without the KYC technology installed will be suspended from July 4th for anyone holding a UnionPay card issued from mainland China. The statement said relevant services will be resumed once the ATM has the KYC function installed. The facial recognition technology is part of Macau’s crackdown on corruption, which aims to stop the battle against money laundering, financial crime and the funding of terrorist groups. Casino revenue in Macau reportedly dropped sharply during the last week of June after the region had been showing positive signs of increased profits, which has led some to believe is due to the introduction of the facial recognition technology. Grant Govertsen, an analyst at Union Gaming Securities Asia told GGRAsia he believed the KYC software is not aimed directly at casino customers. Earlier this year, it was reported more than HK$10 billion was being withdrawn from Macau’s ATMs each month and that special measures would need to be put in place to ensure the machines never run out of bank notes. Despite introducing a limit to all cash withdrawals per transaction, users have been bypassing these restrictions by making withdrawals using multiple bank cards, or having friends and relatives withdraw money on their behalf. The facial recognition aims to help curb this kind of behaviour. Hong Kong could be next to implement the Know-Your-Customer technology, taking inspiration from Macau to tighten the integrity of the city’s financial institutions amid Beijing’s corruption crackdown. Do online casinos have facial recognition technology? No, online casinos are private and protected spaces so they certainly don’t use facial recognition, but online casinos do require players to verify their identification by providing a photo ID like a copy of a passport or drivers license, along with proof of address, before being able to withdraw cash from the site. If you’re looking for a safe, verified and trusted casino site, there are several online casinos available to players from United States. We highly recommend Bovada Casino as safest and the best online casino providing support for players from United States.